French policemen stand guard in front of a makeshift memorial for the victims of the attacks on Place de la Republique on November 19. Shortly before French authorities announced that Abdelhamid Abaaoud had been killed in Thursday’s police raid in Saint-Denis, the National Assembly voted to extend the state of emergency in France for another three months. The Senate is expected to approve the measure by the end of the day Friday. Under a state of emergency, police would have much more leeway when it comes to house searches and arrests. Off-duty officers would be allowed to carry their guns at all times, according to Deutsche Welle, and authorities would be able to stop people or vehicles at certain times and places. 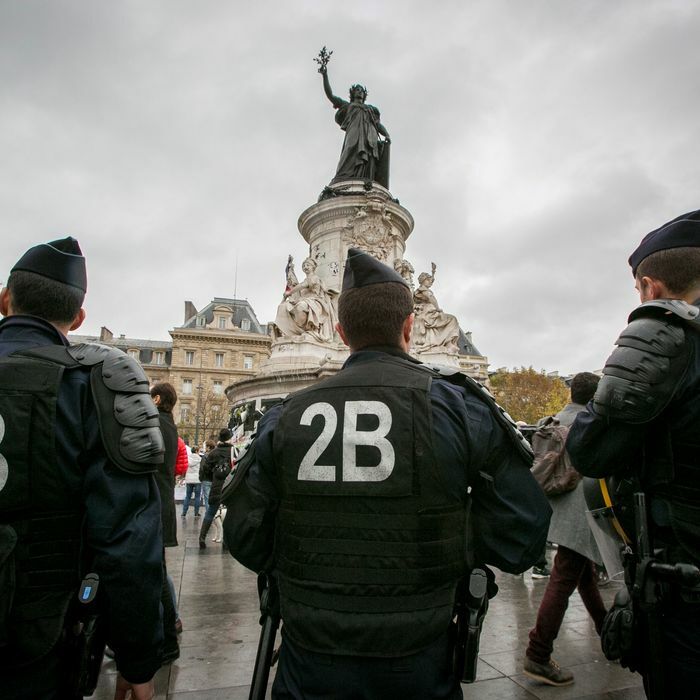 While French Parliament finishes its debate about expanding police privileges, Interior Minister Bernard Cazeneuve is looking outward toward the rest of Europe. He wants all interior ministers in the European Union to hold an emergency meeting on Friday; Cazeneuve also wants member states to start sharing information about airline passengers and work harder to stop arms traffickers, according to The Guardian. EU countries had previously been wary about the airline-passenger sharing system, citing privacy concerns. “We must act fast and firmly. Europe must do that, as it remembers the victims and their families,” he said on Thursday. At the emergency meeting, the ministers will also reportedly consider implementing “the necessary systematic and coordinated checks at external borders, including on individuals enjoying the right of free movement,” according to Deutsche Welle. In other words, it may be harder for citizens in Schengen zone countries to cross borders in the near future. French president François Hollande has also called for additional air strikes in Syria. At least 33 ISIS fighters have been killed in air strikes in the past few days. Here’s a look at what other countries are doing today, nearly a week after the attack — plus a few things you may have missed from the past few days. On Thursday morning, Belgian authorities conducted raids in Brussels, in an attempt to find the friends and family of 20-year-old suicide bomber Bilal Hadfi. At least two people were detained. Meanwhile, Belgian prime minister Charles Michel announced that he wants to spend an additional $427 million on domestic security services and counterterrorism efforts. Michel also told Belgian legislators, according to Reuters, that he plans to introduce bills that would allow the government to “jail jihadists returning from Syria, ban hate preachers and close down unregistered places of worship.” Other measures would lengthen the maximum detention time in Belgium to 72 hours — the current limit is 24 — and allow nighttime terrorism raids for the first time, according to the New York Times. 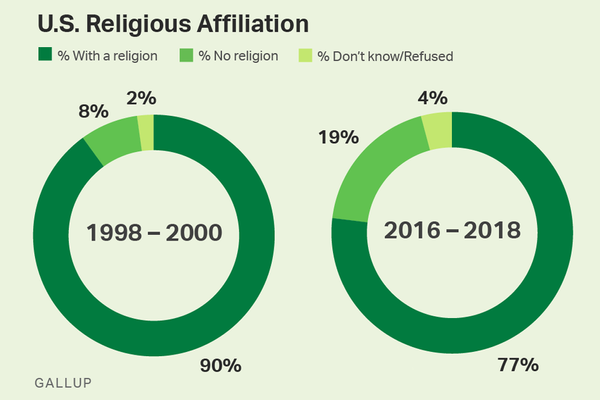 At least one human-rights group in the country has expressed worries about the far-reaching powers that some of the legislation would legalize. Michel made it clear that he wasn’t happy about the fact that several people had been blaming Belgium for not realizing the attacks might have been planned in Brussels. “Also I don’t accept the criticism seeking to disparage our security services, who do a difficult and tough job,” he said on Thursday. 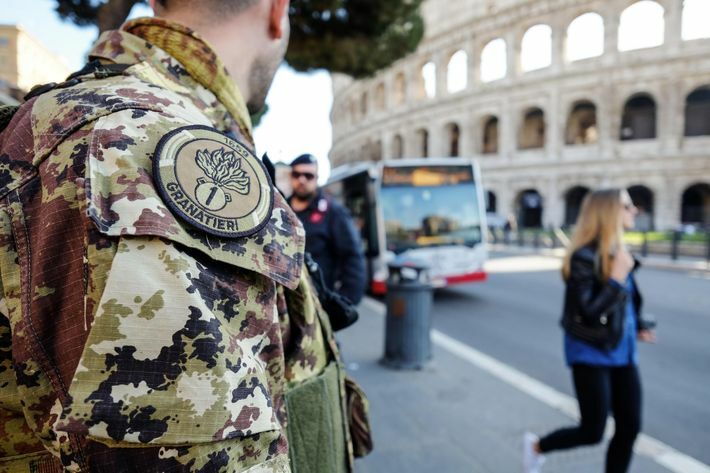 The U.S. embassy in Rome warned Italian authorities that famous landmarks in Rome and Milan — like St. Peter’s Basilica and La Scala opera house — could be terrorist targets. “There are no direct signs of concrete threats” yet, according to Italian news outlets, although the authorities have been searching for five suspects that were reportedly flagged by the FBI. Countries on the European Union’s eastern border have made no secret of the fact that they are not fans of refugee resettlement quotas — and they’ve begun using the Paris attacks as another way of explaining why they are right. Slovakian prime minister Robert Fico told reporters on Monday, “We are monitoring every Muslim in our territory, we have increased monitoring of a refugee camp and detainment camps, as well as monitoring of far-right extremists.” He added, according to Reuters, “With the exception of Norway’s (Anders Behring) Breivik mass shooting, virtually every time there has been a terrorist attack representatives of the Muslims were responsible, therefore if we have these people staying in Slovakia legally it’s our duty to verify whether they have contacts with problematic persons.” Earlier this year, Fico got some backlash for saying Slovakia would prefer to rehouse Christian refugees if possible. The new foreign minister — Poland’s far-right party took the reins of government on Monday — offered his own idea for how to deal with the continuing influx of migrants, according to the Washington Post. “Hundreds of thousands of Syrians have come to Europe recently. We can help them form an army. Tens of thousands of young men disembark from their rubber dinghies with iPad in hand and instead of asking for drink or food, they ask where they can charge their cellphones.” The new government has also said it no longer wants to accept any refugees.